You were a dear to telephone me this morning and the sound of your voice made me very, very happy. I am so anxious to see you, and wish that I could catch the train this afternoon instead of to-morrow. 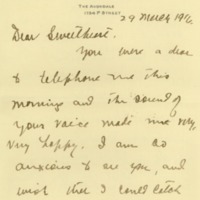 Grayson, Cary T. (Cary Travers), 1878-1938, “Cary T. Grayson to Alice Gertrude Gordon Grayson,” 1916 March 29, WWP20977, Cary T. Grayson Papers, Woodrow Wilson Presidential Library & Museum, Staunton, Virginia.